In less than 16 weeks, summer will officially be here. Just enough time for you to get in great shape and feel your best for the summer. Step by step, let’s get you ready! STEP 1: Take an honest assessment of yourself. Before getting started, you will need to conduct an honest assessment of your current fitness level and body composition. When I work with a new client, one of the first things we do is to establish a baseline. If you don’t know where you are starting from, how will you be able to measure your progress? We establish starting numbers for weight, body fat percentage and circumference measurements of key body parts. I often have my clients take pictures in a bathing suit or board shorts from the front, sides, and rear angles. To measure current fitness level, we can look at several variables including but not limited to: one mile run, maximum repetitions of pushups, pull ups, and sit ups in one minute, and one repetition maximum (1RM) of squat, bench, and deadlift. We will use all of this data to assess strengths, weaknesses, and our starting baseline. Now that you know where you stand, you can set goals. These goals should be motivating and inspiring, yet realistic, achievable, and safe in accordance with sound exercise science and nutrition. improve body composition by reducing a set number of inches from key body parts i.e. hips, waist, etc. all while simultaneously improving your overall fitness. We can also set performance goals. For example, reducing your one mile run time by 1-2 minutes, increasing strength levels on the fundamental lifts, or increasing the number of pull ups or pushups you can perform in one minute by a certain percentage. Here is the most challenging section of this entire 5 step plan. I could write an entire article or multiple articles on this subject alone. Yet, let me touch on the two basics to get you started. Schedule: How many days per week can you commit to your program? How much time can you devote to each workout? These questions need to be answered honestly in order to create an effective workout template that you can adhere to for the duration of the program. Program Parameters: Now that you have assessed your current state of health and set realistic goals, you can create your training template. You will designate the exact times and volumes of your strength training sessions, cardio sessions, and mobility/flexibility sessions. The style of training is also a factor to consider. For example, do you prefer powerlifting, functional style, or bodybuilding programs? STEP 4: Fuel your body; proper nutrition is a must! In order to be successful in achieving your summer beach body, a sound nutritionally balanced diet is paramount. If you wish to lose weight, you must ingest less calories than you expend. Eating a high quality diet that is high in protein, healthy fats, and nutrient dense foods with minimal processed, highly refined foods is essential to achieving your optimal body composition. This is the most important of all five steps. A perfect plan is worthless unless it is executed with conviction. 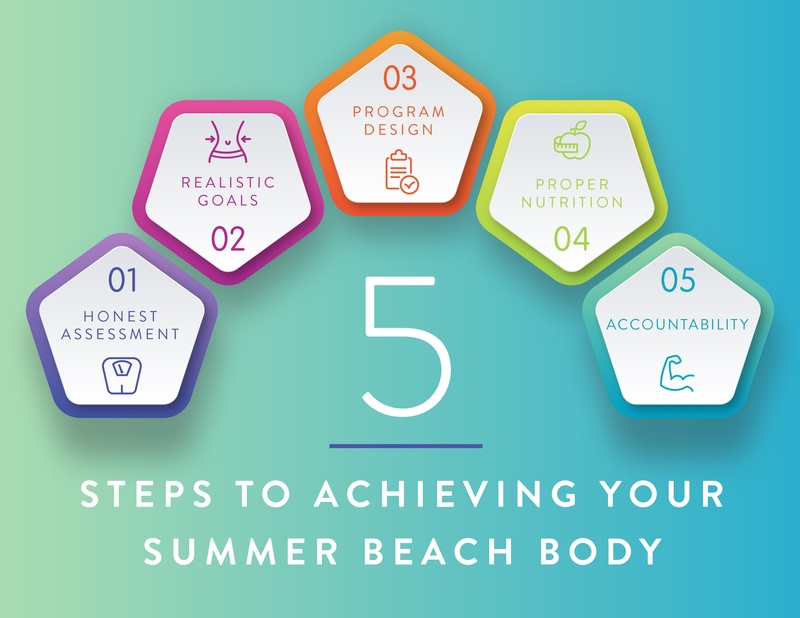 To reach your goal of a summer beach body, you MUST be consistent and devoted in following your program. Find an accountability partner. Check in with your partner daily, share stories, encourage each other, and be each other’s support system. Find a dedicated training partner. There is nothing better than having an awesome workout partner that you look forward to meeting for your workouts. You and your partner will rely on one another and push each other to achieve your goals. 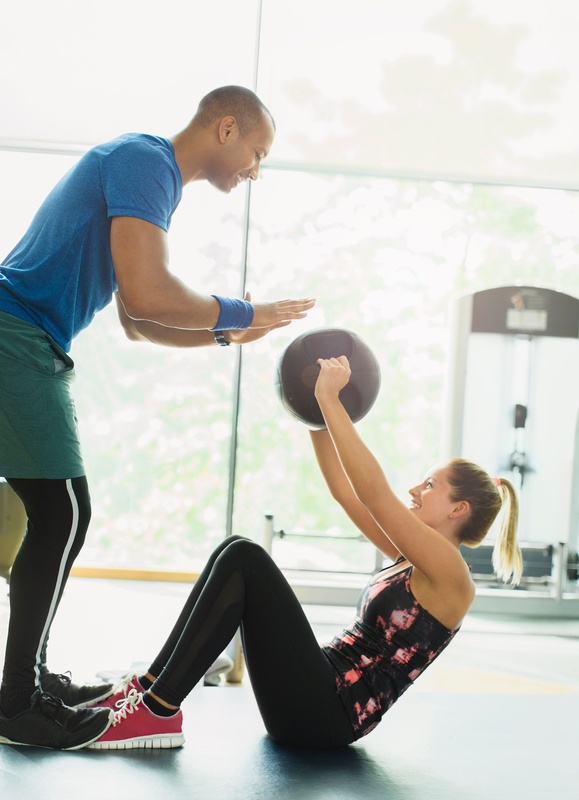 A qualified personal trainer can help you with all five of these steps to take you to the next level. With only 16 weeks left, consider investing in a 12 week personal training program to help you achieve the success and results you desire. I challenge and empower each of you to make this commitment to your health and fitness as this will be the greatest investment you will ever make.